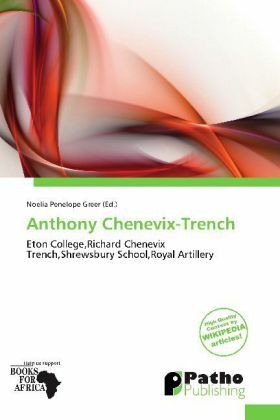 Anthony Chenevix-Trench (10 May 1919 21 June 1979) is best known as the Headmaster of Eton College from 1964 1970.He was the son of Charles Godfrey Chenevix Trench (1877 1964) and Margaret May Blakesley.His grandfather was Richard Chenevix Trench (1807 1886), Archbishop of Dublin.He was educated at Shrewsbury School and Christ Church, Oxford. He fought in the Second World War and attained the rank of Captain in 1939 in the Royal Artillery. At the fall of Singapore in 1942, he was taken prisoner and remained a POW for three and a half years at Changi Prison and working on the Burma Railway. He graduated from Oxford in 1948 and became an assistant master at Shrewsbury, where he was a housemaster between 1952 and 1955. He was Headmaster of Bradfield College between 1955 and 1964 and, whilst there, he held the office of Justice of the Peace (J.P.) for Berkshire in 1960.